Some things just work, even if at first sight they look a little incongruous, such as The Unthanks in harness with the current British champion brass band, the Brighouse and Rastrick Brass Band. But together they really do represented a remarkable combination, and last nights show at St George’s in Bristol was an evening to remember and savour. Here we all were, ostensibly mostly soft southerners (there were bound to be a few hardened northerners present, but you get the general idea) gathered in a re-purposed church listening to an evening of predominantly northern stories, frequently describing scenes and hardships we had little knowledge of, and delivered by that most northern of things, a serious brass band with the unmistakable sounds of Northumbrian voices. I have to admit to some weird twinge of cultural guilt and voyeurism, but enough of that…. What inevitably bound us together was a love for the music, and with the very opening of Becky Unthanks delivery of King of Rome, with a brilliantly scored brass support, the bar was set for the evening. All the Unthanks have the most remarkable of voices but tonight Becky just about stole it for me, there is such a quality to her voice, she could sing a shopping list. The subject matter of King of Rome; pigeons, honest working men and women looking for release, also set the tone for much of the set. Riven through were the tales of loss and disaster (not a cheery set but what did we expect!) and especially poignant, given the loss of four miners in south Wales this week, were those songs that echoed such tragedies and hardships – Trimdon Grange, The Testimony of Patience Kershaw and Gresford, the miners hymn, delivered by the BRBB on their own. The suite written by Adrian McNally, in honour of George his son together with Rachel Unthank, commissioned as part of the project that brought The Unthanks and the BRBB together also dealt with oppressive forces. The suite had a version of Ewan MacColl’s Father’s Song at it centre, beautifully delivered by Rachel and Becky. Both halves of the show contained a ‘solo’ session for the band to let them display their extraordinary talents and make to plain why they are national champions. As Adrian McNally pointed out later on, it is worth remembering that bands such as this are fully amateur, twining performances around their working lives. The second half started with a moving version of Felton Lonnin, the video of which is embedded below (apologies for the artisanal quality and should its presence here somehow offend I will happily remove). Despite a couple of more rousing songs such as a brilliant Blue Blazing Blind drunk and the Manhattan Transfer style treatment of Queen of Hearts by Chris Price, the evening was predominantly a more low key affair, and none the worse for that. An inspired partnership of two bands at the peak of their powers. The show was being recorded by the BBC apparently for transmission in two chunks in about six weeks (I guess that makes it around the end of October) slightly incongruously on BBC Radio 2’s big band show or suchlike. 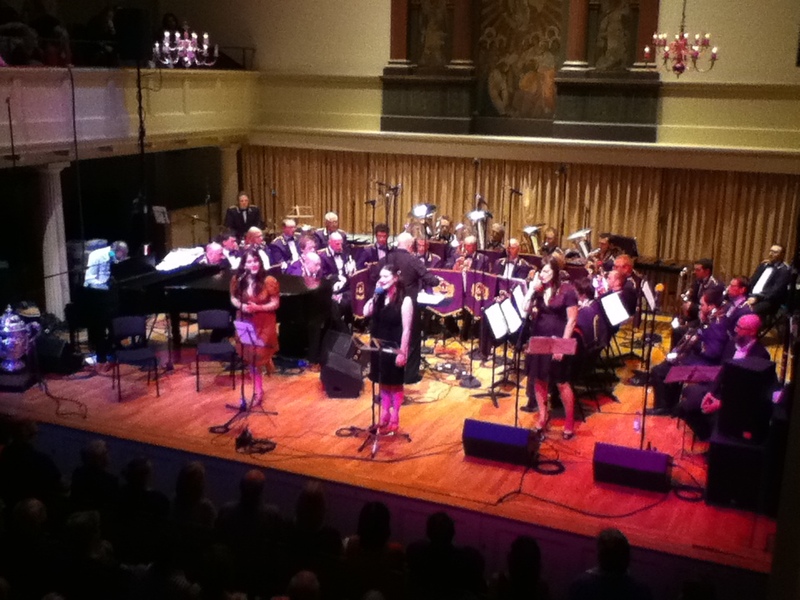 This entry was posted in Uncategorized and tagged BBC Radio 2, Brighouse and Rastrick Brass Band, Ewan MacColl, The Unthanks, video. Bookmark the permalink.